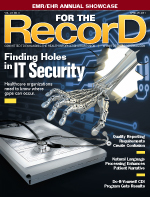 One privacy misstep can land healthcare organizations in hot water. With healthcare organizations increasingly moving to electronic means of storing protected health information (PHI), securing that data becomes a much more important task. Adding to the complexity is the rapidly growing number of diverse technologies used for processing and storing electronic PHI (ePHI). Each platform has its own format for recording specific activities, making it difficult for organizations to easily discover nefarious behavior. Mac McMillan, chairman and CEO of CynergisTek and chair of the HIMSS Privacy and Security Steering Committee, believes the biggest problem with data security is a lack of appreciation or understanding for what it takes to actually do it correctly, which unfortunately translates all too often to a lack of focus and resources. At Lourdes Health System in Delran, N.J., “integrity in action” is the theme of its corporate compliance program. From administration and medical staff to department associates, the health system has developed a compliance awareness campaign that works to ensure all staff members understand they are accountable for their actions. Barbara Holfelner, chief compliance officer and vice president for patient safety, risk management, and corporate compliance, says within a hospital setting, staff are exposed to confidential information and need to be champions for the protection of patient information and rights. The health system’s IT department also conducts periodic scans on its information security systems and has internal measures to handle any problems that might occur.